Royal arms of Spain, Quarter four is taken from Quarter one of the Spanish arms for Rene Jose Gonzalez. the Arms of Prince Ernst August zur Lippe are imposed on the shield of the Society's Arms indicatin his position as Chairman. The symbols of the Principality's coat of arms are taken from historic roots and represent elements of the arm or heritage of the four founders. A continental shield quartered by the Cross of St. George, argent. 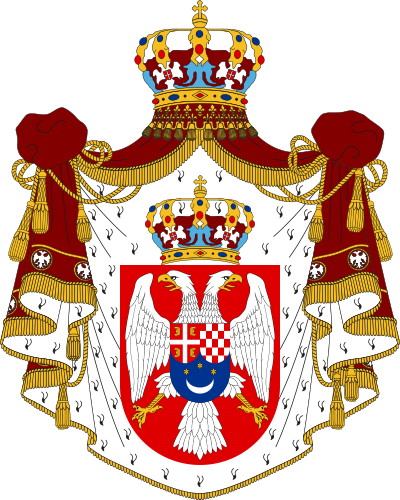 In the first quarter the Royal Arms of Serbia a cross argent on field gules forming four quarters with ocellus facing one and three sinister and two and four dexter. In the second quarter the Ducal Arms of Argyll composed of a one sailed boat sable on a field or. In the third quarter three oak leaves and acorn proper on a field or. In the third quarter a Castle argent on a field gules. Over all is imposed the Princely Arms of Lippe, recognizing the current Chairman of the Society. For crest a royal crown of five closed arches surmounted by an orb. Each arch rises from a jeweled band of crosses patee and fleur de lis which is set upon a ermine band. 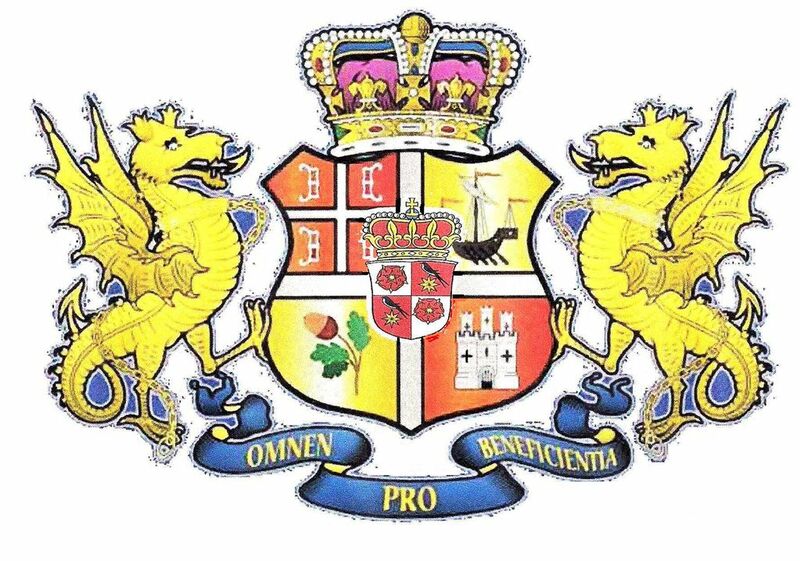 The whole supported by two winged phoenixes at dexter and sinister, each resting on a motto band azure with the Latin inscription "Omnem Pro Beneficentia" or. To help you translate, red is gules, gold is or, blue is azure, black is sable. Quarters are numbered from upper left to lower right. Quarter one represents HRH Prince Tomislav, quarter two HG The Duke of Argyll, quarter three for Roger Carlton Sherman and quarter four for Rene Jose Gonzalez. The motto translates as "All for Charity"